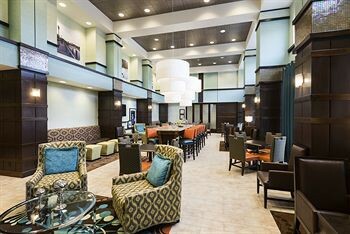 Property Location Located in Newark, Hampton Inn & Suites Wilmington Christiana is convenient to Christiana Care Health System and Christiana Mall. This hotel is within close proximity of Omega Shops Shopping Center and Delaware Park Racetrack and Slots.Rooms Stay in one of 136 guestrooms featuring flat-screen televisions. Complimentary wireless Internet access is available to keep you connected. Conveniences include coffee/tea makers and irons/ironing boards.Rec, Spa, Premium Amenities Enjoy recreational amenities such as an indoor pool and a fitness center. Additional features include complimentary wireless Internet access and gift shops/newsstands.Dining Grab a bite from a grocery/convenience store serving guests of Hampton Inn & Suites Wilmington Christiana.Business, Other Amenities Featured amenities include a 24-hour business center, dry cleaning/laundry services, and multilingual staff.